Marvel has given us a pretty good look at what became of Mon Cala at the beginning of and toward the end of the Empire. 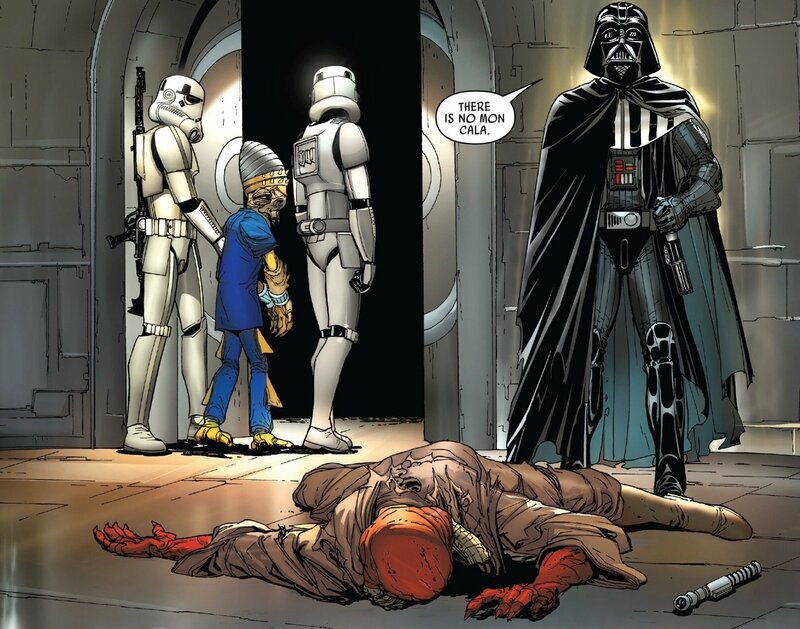 Darth Vader #17 doesn’t leave one with a lot of hope that the Mon Cala will ever be able to rise up against the tyrannical rule of the galaxy. 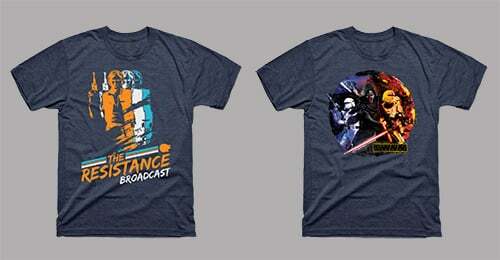 Tarkin, Vader, and a group of Inquisitors are determined to boil the seas of Mon Cala to enforce the Emperor’s rule. This issue is a great one, but it’s bleak as heck. SPOILERS AHEAD…. Ferren Barr has managed to turn Order 66 against those who would enforce it. It’s a tricky move, as he knows the last generation of clones still have the Emperor’s secret mandate in their heads. It sure works out well for he and Verla, as they are able to escape. This is a cool moment between Barr and Verla. He knows there are other Jedi out there still and I love the idea he’s placing his trust entirely in the Force. This is the last time we see Verla, though I’d say this is a nice open-ended way to send her out into the galaxy. Though she’s not a Padawan that came up through the Jedi Order, she’s well aware enough of the Force and who the Jedi are to carry on that torch. This must be another reason Vader and the Inquisitors were busy for years extinguishing the fire of the Jedi – those the surviving Jedi taught after Order 66 spread through the galaxy as well. I suspect we’ll be hearing more from Verla as the stories about Vader’s Jedi hunt continue to be told across different mediums. The Clone Troopers manage to take out almost all the Inquisitors, save Ninth Sister. I have to imagine this was a pretty big blow to the Sith. 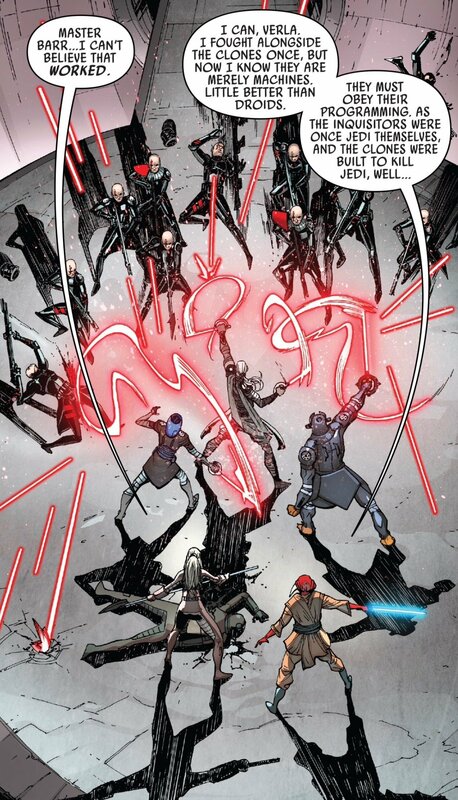 Palpatine had these Inquisitors trained and handed them over to Vader – and they’ve pretty much all been used as cannon fodder. I can’t imagine Palpatine is going to be too thrilled with his apprentice, especially as the uncertainty about all Jedi being dead still looms. The Emperor may have little regard for life, but I don’t imagine he likes to waste resources. Ninth Sister pursues Barr after she dispenses with the Clone Troopers. The art in this issue is insanely good! Here’s Vader on the move to catch King Lee-Char. 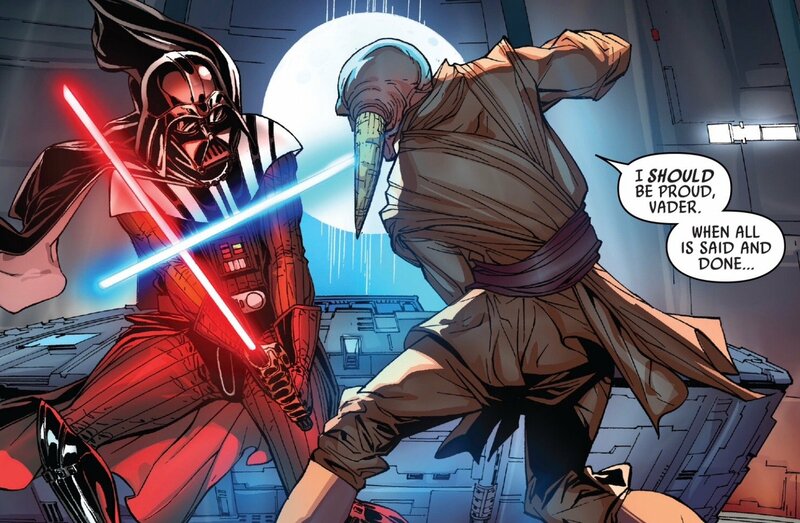 As you can see, Vader had little difficulty with the Mon Cala royal guard. Artists Giuseppe Camuncoli, Daniele Orlandini, and colorist David Curiel really pile on how dire the events of this issue are. As mentioned, this isn’t a Star Wars story that leaves you feeling good about anything in the galaxy after you read it. The Empire and Vader are merciless in their pursuit to control Mon Cala. Every line and splash of color underscores how brutal a galaxy this story unfolds in. 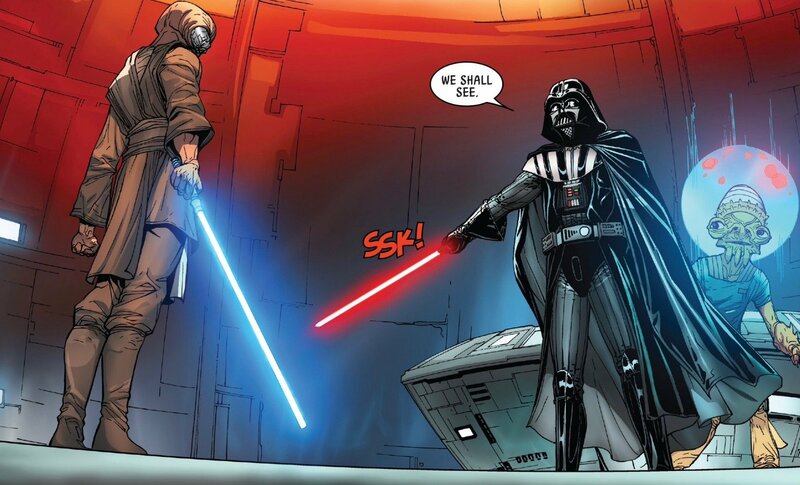 Vader gets his capture, and Lee-Char is just as defiant as other royal prisoners Vader will later take in life. 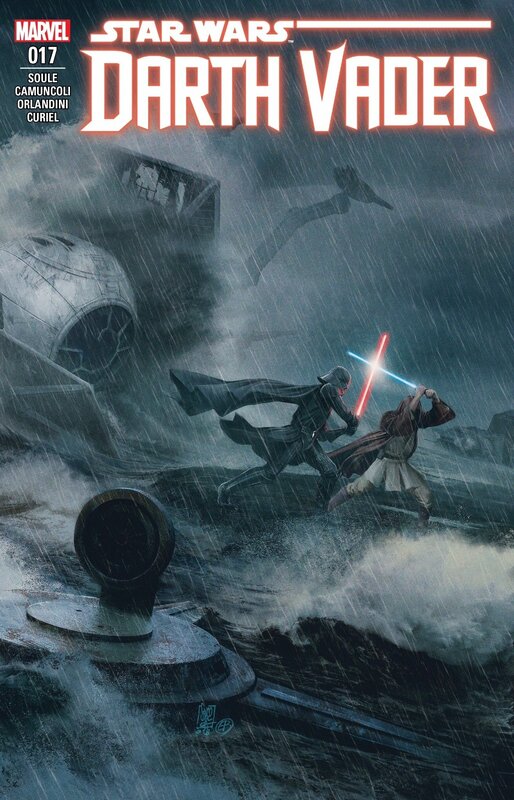 Lee-Char tries to take Vader out with a blaster, but the Sith blade deals with that. 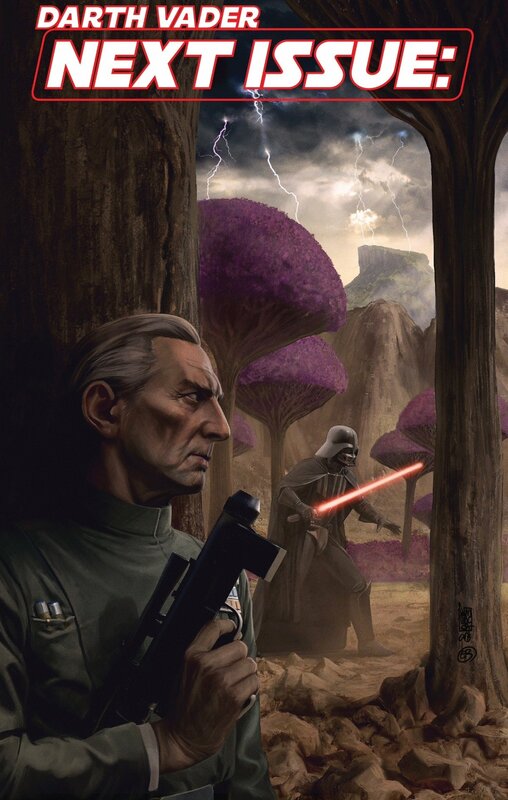 When Vader contacts Tarkin (remember, Vader capturing the king is a personal favor for Tarkin), Tarkin merely instructs him to take Lee-Char to a window so he can see first hand what the Star Destroyers are going to do to the waters of Mon Cala. Writer Charles Soule pulls no punches in this issue. In a one-two-three, the Star Destroyers concentrate their fire power on heating the seas of Mon Cala and extinguishing billions of live. This is all being done by Tarkin, with the sole aim of getting Lee-Char to pledge loyalty to the Empire. It’s the Empire at it’s nastiest. 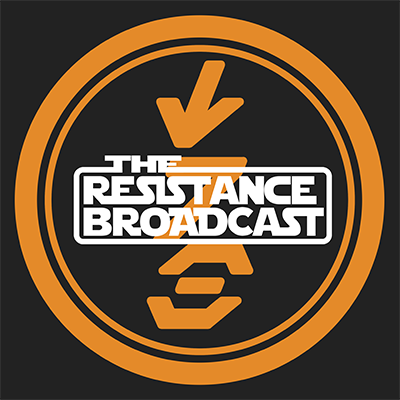 There is no resource grab or bureaucratic corruption – it’s mass murder and a demonstration to the people of the galaxy that even the most proud can be brought to their knees. Lee-Char is defiant as ever, just as Barr shows up to face down Vader. He’s ready and there’s a new dimension to his demeanor – something almost hateful. It’s something to think about: Jedi that have been bound by code, dogma, and an Order could possibly slip in their morals out of desperation. Barr is definitely in that camp. He hasn’t gone full dark, but you’ll find out that Barr has slipped down the moral slope so he could get to Vader and the Empire. In the midst of the battle, Barr makes a shocking revelation: he is the one who assassinated the Imperial ambassador, which started this whole mess! Jedi morals crumbling left and right. 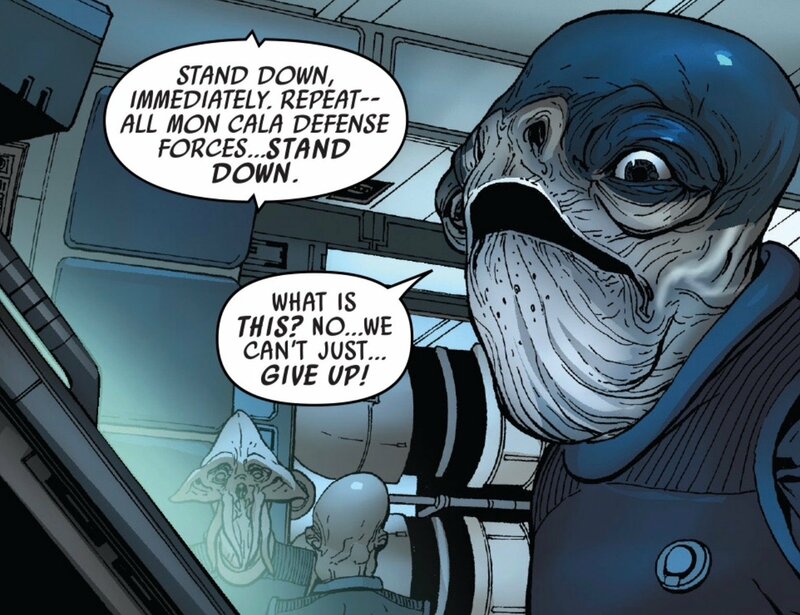 Barr did it to force a confrontation, knowing that Mon Cala was the only planet with a fleet that could stand up to the one the Empire was building. If Mon Cala joined the Empire, it would seal the fate of any rebellion that would come in the future. 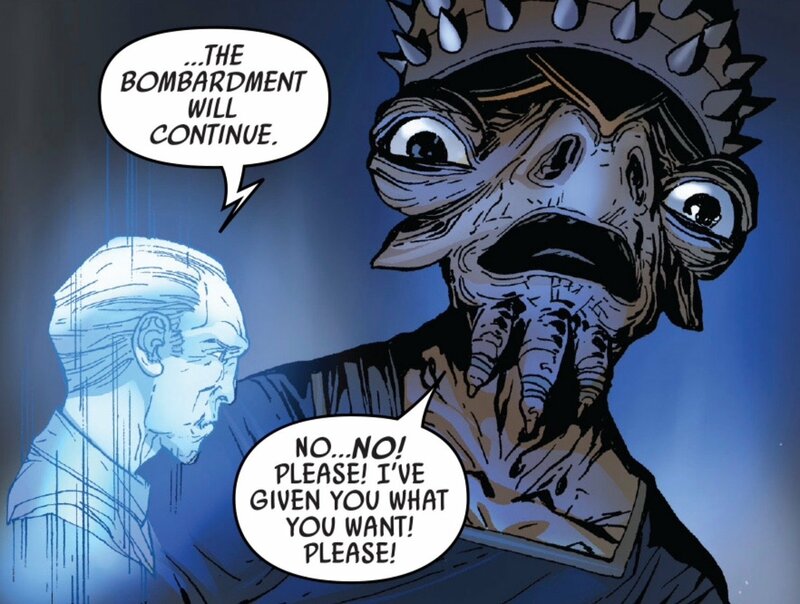 Speaking of the future, Barr seems to have glimpsed the fate of not only the Empire, but where we left the Resistance/Rebellion at the end of The Last Jedi. He’s well aware of what the Mon Cala fleet will mean to the Rebel Alliance. All that said, that’s pretty messed up to sacrifice billions of unwitting lives, and it’s pretty crazy how far gone it indicates Barr is. Lee-Char is horrified that his people are being murdered because of one Jedi’s actions and calls for a full surrender. Raddus isn’t happy about that, and a few other commanders share the sentiment. Raddus has gathered a number of ships near the southern pole of Mon Cala and they’ve managed to create a massive defensive field. They’ve left the northern part of the planet vulnerable and are left in a pretty hopeless position, now that their king is ordering them to stand down. Raddus can see that this fight is one they are in and can’t back down from. Lee-Char just wants to save lives, but the military commander in Raddus sees that this is just the beginning of what the Empire can do and that they may have the resources to take a stand. King Lee-Char has not seen A New Hope, so he doesn’t know that Tarkin’s method of persuasion is also his method of punishment. Since Tarkin’s had a bad day trying to cull Mon Cala, he’s going to make sure it’s king and people do to. Tarkin continues to unleash the Empire’s fury on Mon Cala, boiling the seas and bringing the end of the world as the Mon Calamari know it. There are some pretty devastating frames toward the end of all the giant marine life, floating dead, as well as the billions of Mon Calamari and Quarren lost in the assault. If there was ever a doubt, Tarkin is a sadist. Raddus makes a break for it with a few ships in the Mon Cala arsenal. As mentioned above, Barr tells Vader that was his goal all along. 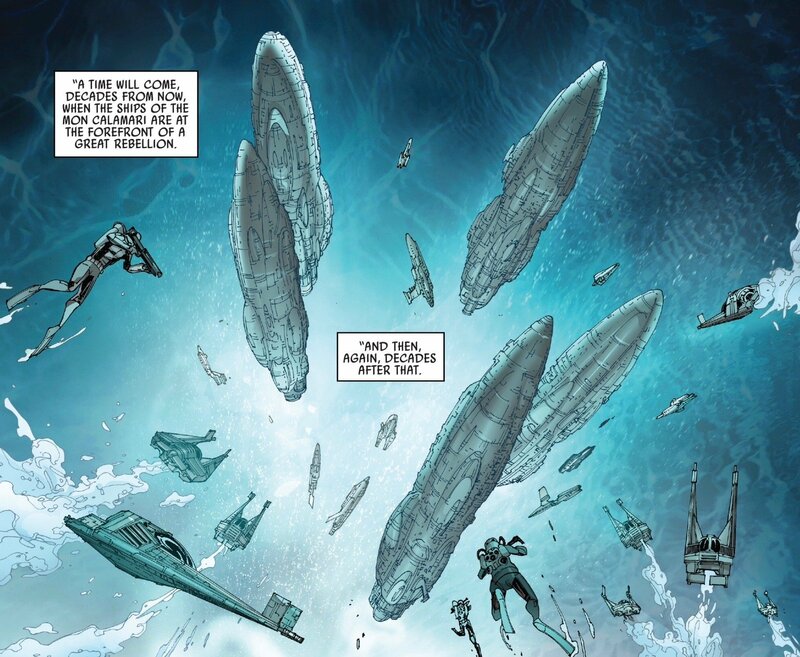 On a related comic note, Marvel’s titular Star Wars returns in a couple weeks just after the Rebel Alliance celebrated getting a full fleet of Mon Cala ships. Since these four here were already out and about with the Rebels, I’ve got a very bad feeling about what’s in store for the rest of the fleet in that arc (not to mention the arc is titled “Hope Dies”). Back to Darth Vader, these four ships will go on to play a massively important role in the future of restoring democracy to the galaxy, but I don’t know what the soldiers aboard would think of the way this battle brought them to that realization. Barr forced a conflict that – I assume – mostly cost civilian lives. I doubt Raddus would have been okay with that. Yet, Tarkin lets the four ships get away. 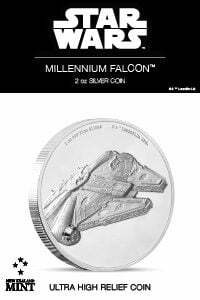 This proves, as always, overconfidence is the weakness of the Empire. 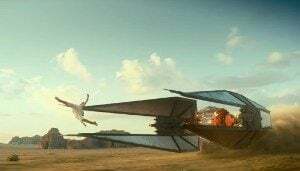 Who knows if the three Star Destroyers could have stopped them, but Tarkin just sealed the fate for the second Death Star and the Supremacy (Snoke’s ship). I’d say he would have rolled around in his grave, except Tarkin was space dust at that point. The Empire always underestimates their adversary based on disadvantage, and never takes into account the passion which with they fight. At least it gets him to stop firing on Mon Cala, though. Sheesh, if that doesn’t leave you with a pit of sorrow in your stomach, I don’t know what kind of Star Wars fan you are. I don’t sympathize with Barr. I appreciate and understand his desperation, but he just condemned billions to their death and allowed the Empire to steam roll their way in. I mean, that could have happened on its own entirely, but Barr forsaking the teachings he was raised on and not recognizing that move was wrong makes me pretty unsympathetic to him. I’m never happy to see death, but that’s obviously the fate Barr resigned himself to. Just a very unsettling end to this dark chapter in the galaxy’s history. 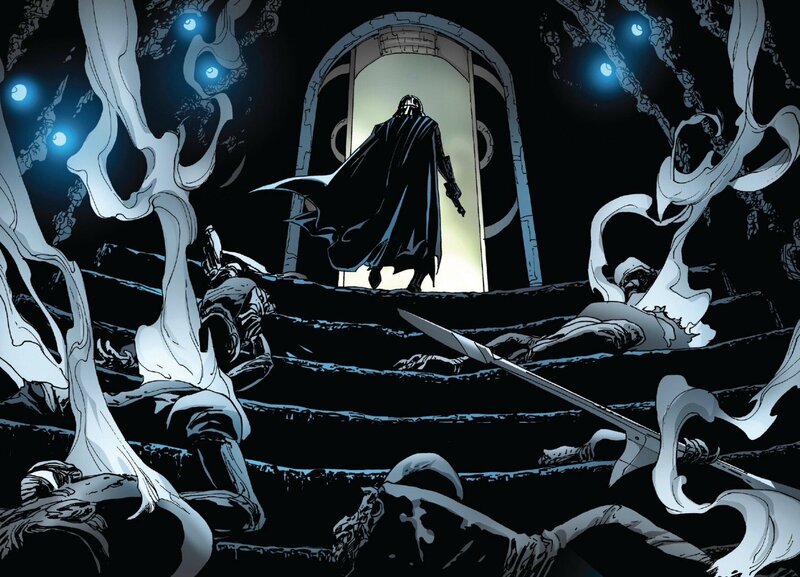 We also know how it ends for Lee-Char decades down the road, and I have a feeling by the time we know the whole story with the release of Star Wars #50, Mon Cala will be one of the great tragedies of the Star Wars Universe. As unsettling as this arc was, writer Charles Soule continues to deliver some excellent storytelling. Between his continuing work on this book and Poe Dameron, I’m continually amazed at how consistently his books rock my world. 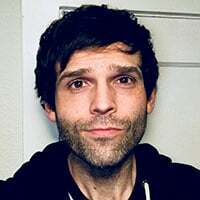 He’s someone I hope Marvel keeps at the helm of Star Wars comics for as long as they can. 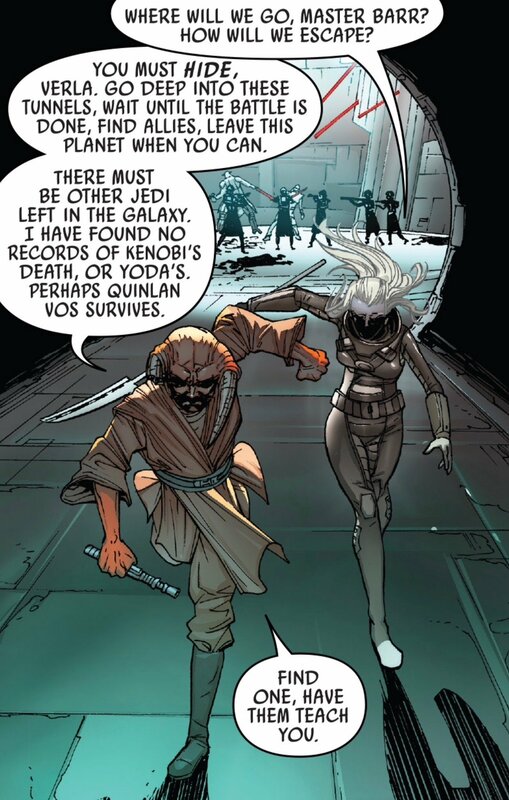 The connective tissue he so subtly lays to other parts of the Star Wars lore is skillfully done and why I look forward to getting my hands on each new issue of this book. The artistic team of Giuseppe Camuncoli, Daniele Orlandini, and colorist David Curiel add a vivid depth to the storytelling and this issue was just stellar to look at. I see great things ahead for Marvel’s Darth Vader.